Review: Ellie Goulding - Vector Arena, October 2016. It’s been a whirlwind few years since Ellie Goulding’s last return to New Zealand - and in the two-year-period she’s released a brand-new album in the form of ‘Delirium’, as well as spent most of 2016 on the world tour for that same album - which is what brought her back to our country for two very special shows, one of which being last night at Auckland’s Vector Arena. The introduction to the show was the title and opening-track on the new album, ‘Delirium’, which brought the show to life, before Ellie had even appeared. ‘Aftertaste’ kicked off the show, one of our ‘Delirium’ favourites, yet it was clear from the outset that Ellie is just the same as ever - even doing one of her well-known drumming solos during the song. The show was on a much bigger scale than Ellie has ever done before in New Zealand, with a group of four male back-up dancers who had dance breakdowns every few songs - turning the show into even more of a spectacle. ‘Something In The Way You Move’ was followed by her Calvin Harris collaboration, ‘Outside’, two songs that had the audience on their feet and dancing - from the young girls accompanied by their parents sitting behind me, to the two mums having a night out together in front of me. Despite being no stranger to large crowds considering how many people she performs to on a regular basis, she still explained she was feeling quite shy with the crowd - however went on to say, “It’s a good vibe in here tonight,” before launching into the upbeat ‘You My Everything’, followed by an acoustic guitar rendition of the emotional ‘Devotion’. Many a costume-change occurred during the show, creating mini-sections throughout - from the geometric costuming for ‘Keep On Dancin’’ and ‘Don’t Need Nobody’, to the long white gown she wore for the more emotional songs, the show was a true testament to Ellie’s versatility as an artist. The most emotional moment of the whole show came just prior to ‘Army’ (after she played new song ‘Still Falling For You’ for the third time ever! ), where she explained how the song was about her best friend, Hannah. The backdrop then displayed a whole montage of old + new photos of Ellie with Hannah, showcasing their friendship not only through the song - and live footage from friends at the show was also displayed on the screen, creating a real sense of intimacy in the venue. Before performing her final song of the night prior to the encore, Ellie spoke about how she used to figure out how many people were watching her show - sharing fondly that, “I remember playing to 20 people in a pub in London once” - going on to ask everyone to turn their cellphone lights on. The entire arena lit up, and then Ellie asked everyone to turn their cellphones off for just one song in it’s entirety, before launching into ‘Burn’. But thankfully the show was not over then, as she returned for a two-song encore of her ‘Halcyon’ song ‘Anything Could Happen’, ending with ‘Love Me Like You Do’, with a confetti cannon spraying confetti into the air during the final, triumphant chorus. MusicEllie Goulding covering Bastille's 'Rhythm Of The Night'. MusicInterview: Ellie Goulding on her upcoming 2014 New Zealand 'Halcyon Days' arena tour! MusicEllie Goulding - 'Something In The Way You Move' music video. FashionInterview: Lucy Wearing on the M·A·C x Ellie Goulding collection. MusicEllie Goulding will play the 2015 AFL Grand Final + her new single is called 'On My Mind'. 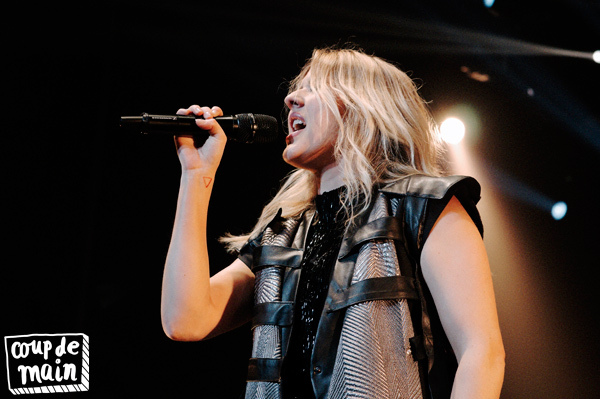 MusicWatch: behind the scenes on Ellie Goulding's tour.